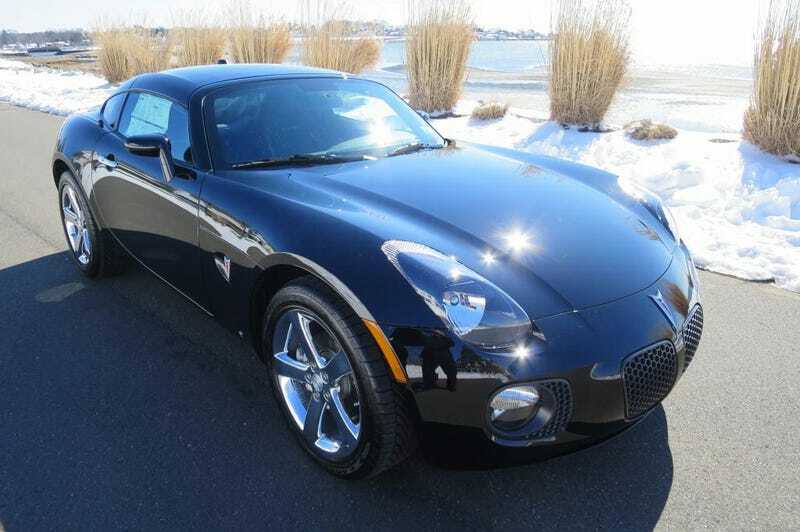 For $49,000, Does This 2009 Pontiac Solstice GXP Prove Patience Is A Virtue? Today’s Nice Price or Crack Pipe Solstice has done just 25 miles over the course of its nine years of life. That makes it practically new, but does it also make its price practically a steal? Let me ask you something; would you eat at Chipotle? That question arises because, while their burritos and burritos in a bowl are filling and undeniably very tasty, there’s a sense of trepidation in eating there owing to the multiple E. coli outbreaks that have plagued the chain. You may tell them to hold the guac, but can you really be assured they’ll do the same with the diarrhea? This dichotomy is pretty much how the comments went on yesterday’s 2005 Dodge Neon SRT-4 ACR. That little car had been factory hooned to within an inch of its life, making it likely the MOST desirable Neon imaginable. On the other hand, no one ever really imagines desiring a Neon. Or will admit to it. In an odd reversal on the Chipotle situation, that car’s Neon base is actually the Escherichia coli to its ACR update’s tortilla filled with tasty goodness. At $14,800, not even low miles could mask that stigma, and the ACR fell in an overwhelming 85-percent Crack Pipe loss. Now, the seller of that Neon thought he could build bank on the fact that the car appeared to be in really nice shape, and rocked what were in fact appreciably low miles. What however, if there was a car of reasonable note that was essentially new, and had almost no miles? Here we have just such a car—a 2009 Pontiac Solstice GNX targa coupe—and it rocks fewer miles in total than you probably drove on your way to work today. That’s right, someone bought this Solstice back in the day, and then squirreled it away with just 25 miles on the clock, likely awaiting this very moment as the point when his or her patience would pay off. Will it? We’ll just have to see. First off, just what the heckin’ heck is a Solstice coupe? I’ll bet a sizable number of you have never seen one of these bad boys in the plastic, and probably even more have likely forgotten they ever even existed. That’s too bad since the Solstice roadster and its targa-topped coupe companion are still to this day some dead-serious head turners. I like them for their looks, but also for the opportunity they afford to play where’d that come from when identifying their various shared components. The Solstice sports fog lights from a Grand Prix and backup lights from an Envoy. Gauges come from a Cobalt, while mirrors are, quite amazingly, shared with the old Fiat Barchetta. There’s plenty more, but then why should I spoil your enjoyment—you go find ‘em for yourself. All those parts found there way together on GM’s Kappa platform, a unique, small RWD chassis that also underpinned the Saturn Sky (also R.I.P.) and an Opel and Daewoo or two (R.I.P., R.I.P.). This one is a GXP and that means it sports the 260-horsepower 2-litre Ectoec four under its plastic clamshell hood. Here that’s mated with GM’s 5L40-E five-speed automatic, a transmission that was also interestingly shared with BMW’s E46 3-series. Above that is a swoopy body that recalls the Datsun 240Z in both profile and size. Pontiac only built 1,266 coupes over its aborted year and a half model run, and out of those, 306 arrived as did this car in Mysterious Black paint. Everything here looks as-new with perfect paint and chrome alloys beneath. It should be noted here that the targa roof, while removable, does not have a place to sit on the car unless it’s doing its roofie duties. There is a canvas roof that can be brought along for on the go weather protection, but that whole thing is a bit dumb. Under that roof, the interior is likewise pristine, even maintaining its airbag tag on the glovebox. That’s something that, like mattress tags, is extremely satisfying to remove. How the present owner could ave resisted the temptation is beyond me. Are those Goodyears the original meats? Maybe, in which case a new owner should consider getting to a tire merchant post haste. Also, there’s the issue of use it or lose it that has to be brought up here. This car may not have done, well, any miles over the past nine years, but that doesn’t mean time, temperature and gravity haven’t wreaked havoc on the seals, bearings, and fluids. Unless you’re plan is to put this Solstice in a box awaiting the next appearance of Bobo there’s probably going to be some apprehension in its use. That use—adding to its meager mileage—also totally obviates much of its uniqueness. Unless you really jonesed for a new Solstice Coupe but saw your opportunity vanish with GM’s untimely snuffing of the Pontiac brand, this may be your last chance. There’s little likelihood you’ll ever find another as-new example without having to perhaps Thomas Crown it out of a museum. Of course, to take advantage of this opportunity, for whatever reason, you’ll need to come up with the seller’s $49,000 asking. Just for shits and giggles, that’s just under twice the car’s original base MSRP. Still, as they soon may be saying at Chipotle; they ain’t making ‘em anymore, and with just a little over 1,200 in the wild your options for buying any Solstice coupe are supermodel slim. With all that in mind, would you pay $49,000 (down from $53,000) for this Solstice? No, of course you wouldn’t. But should anyone? Napoli Classics (dealer) out of Milford, CT, or go here if the ad disappears. At $14,800, Could You Get Enthused About Owning This 2005 Dodge Neon ACR?